Transform search, connect people with information, and evolve the world. RONDHUIT provides the best search solution in Japan . 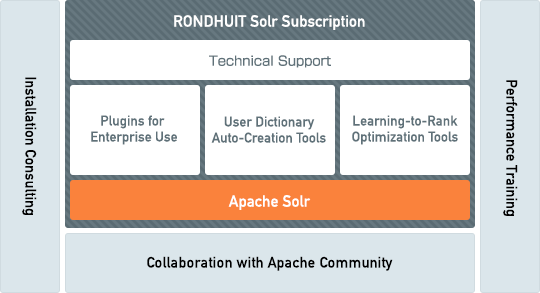 Our Solr Subscription is a latest stable version of Apache Solr uniquely packaged by RONDHUIT in order for enterprise users to utilize the software safely and easily. As Solr support service, of course, is provided with up-to-date knowledge and experience that RONDHUIT consultants acquired through their real-world consulting experience, you can focus on developing your business logic. Most Web sites now have ”search box”. How close your search engine can get to what users are seeking is the key to your success. Our Solr Subscription realizes semi-automation of continuous dictionary maintenance in order to increase the search coverage. Our Subscription learns keywords that users input as well as documents (or products, etc.) they select from search result list and reflects that on search result rank to realize continuous and self-sustained optimization. Enabling you to efficiently and immediately find information necessary to your operation and making that available to you will contribute to increase in productivity. Making information retrieval more efficient will enable you to use your time on more productive tasks. As we reduce the risk of using old and wrong information, you will be able to get hold of and utilize the latest information at once. RONDHUIT's Solr Subscription, depending on the rules of access rights within an enterprise, lists the search results according to privileges. RONDHUIT's Solr Subscription semi-automates tagging, which extracts feature words from document, to creates keywords for search. The auto-complete function is provided to display candidates as you input each character. RONDHUIT's Solr Subscription automatically extracts names of people and places from unstructured documents (flat text) and structure them. Apache Solr, Lucene, Hadoop, Mahout, Spark, ManifoldCF, UIMA, OpenNLP and their logos are trademarks of the Apache Software Foundation.